SONOSAX SX-PR is the smallest and most lightweight stereo mixer available today. All that is needed for powering are 3 C-cell alkaline batteries of 1.5V or NiCad accumulators. An ingenious feature of this modular system is its adaptability to right or left-handed users. The master module with the modulometer may be installed on either side of the mixer. Like all other SONOSAX manufactures instruments, SX-PR has been built using only professional components (conductive plastic potentiometers, switches and connectors with gold-plated contacts, etc.) to ensure unparalleled levels of quality, performance and reliability. In addition, the switches and potentiometers are air-tight and thus dust protected. 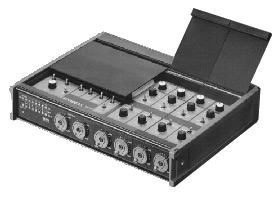 All these features, together with very demanding SONOSAX standards, have resulted in this mixer that meets the needs of News reporting (ENG/EFP) where reliability, size and weight make all the difference whether recording indoors or outdoors. And, to top it all, thanks to the updated electronic characteristics of modern techniques, this tiny little mixer is ALL SET FOR DIGITAL RECORDING! Connected with an R-DAT recorder this equipment enables stereo sound recording of an extremely high quality.